Lisa Corwin (C) speaks to firefighters as they search for a strongbox and a wedding ring through the remains of a neighbor's home in the Fountaingrove neighborhood on October 13, 2017 in Santa Rosa, California. Santa Rosa firefighter Brandon Palmer has fought big blazes in his 20 years on the job, but the 81-hour shift he spent fighting the fire storm in his own neighborhood this week was still stunning. Palmer is one of more than 10,000 firefighters working this week to control the most destructive group of fires in state history. Dozens of people have been killed, and more than 5,000 homes and other structures have been damaged or destroyed. Fighting the fires has been exhausting, days and nights dragging heavy hoses through thick smoke, hiking over steep terrain, hopping on and off trucks. More than 200 hand crews are also on the scene, building fire lines with shovels and bulldozers, slashing through brush with chainsaws and pulaskis, hiking for miles with heavy backpacks. When the fire broke out above Santa Rosa, Palmer — who was off duty — hurried into the station, grabbed his gear and went to work, dragging hoses through vegetation. “We could hear explosions. The sky was glowing,” he said. After his wife and children safely evacuated, Palmer said he lost track of time over the passing days as they rushed from block to block. Although residents were largely out of the area, in one backyard, he came across a big, yellow Labrador. “He was freaked out. We tried to grab his collar. Usually they’ll lick you to death, but he was a little nippy,” Palmer said. With the road open and safe, they called Animal Control and moved on. The firefighters rest when they can, catching short naps, sometimes sprawling on the ground in front of their trucks. They fuel up with quick meals and chug coffee at their fire camps donated by local businesses. While the missions are coordinated by commanders, crews said the radio chatter about new fires, high winds and a rapidly moving front line had them changing tactics. “It was hot, it was steep, we got into some thick smoke a couple of times,” said seasonal firefighter Christina Barker, 30, of Turlock. Hoses were burning up, she said, and at one point they were separated from their engine during a shift that went on for more than 50 hours. “None of us are thinking about the fear or the challenge. We’re just focused on how to be efficient,” she said. On her seventh day of almost nonstop work, Barker said Saturday that community support is keeping her going. During one exhausting shift, her crew was invited in to a home for cold sodas. On Friday night, as she was settling down in her truck for a short rest, a neighbor brought her a cot. “I didn’t have to sleep in the engine,” she said. While local firefighters have hit it hardest, 2,100 members of the California National Guard, 425 law enforcement officers and crews from more than 100 supporting agencies from around the U.S. are also working to stop the blazes, control traffic and protect property. Firefighting helicopters and air tankers are also up, dropping fire retardants and assessing damage. “I’m completely exhausted. I can barely think right now,” said Capt. Jimmy Bernal of the Rancho Adobe Fire District, taking a break during what he described as a very intense week. He said at one point he couldn’t manage to spell his last name. State officials said that while they seem to be gaining control over some fires, others are still erupting. “We are still at it full tilt. 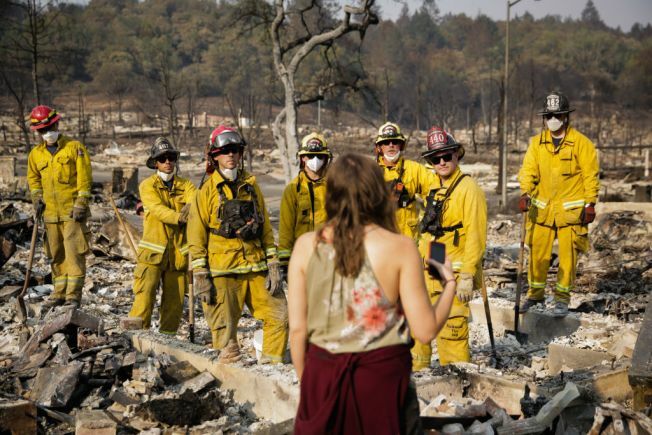 But we’ll get ahead of these flames and preventing more loss of property and life throughout the weekend and into next week and as long as it takes,” California Office of Emergency Services director Mark Ghilarducci said.